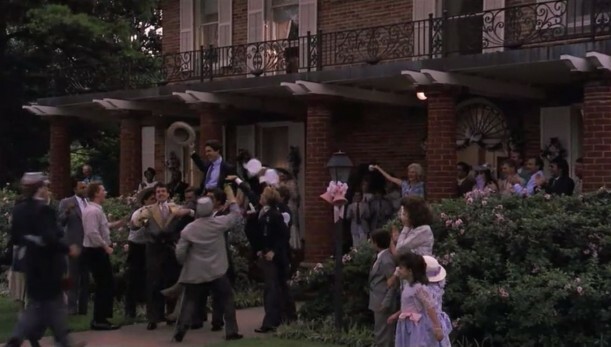 The house where Sally Field and her family lived in the 1989 movie Steel Magnolias is now a Bed & Breakfast in Natchitoches, Louisiana. It was built before the Civil War in the 1830s and sits along the Cane River. It’s on the market for $1.175 million, so let’s compare how it looked in the movie to how it looks today! I don’t know about you, but this is one movie I can’t get through without going through half a box of Kleenex. I just watched it again and bawled my eyes out. The house has 6 bedrooms, 6.5 baths, and 6,000 square feet. M’Lynn’s home is actually two different houses. The Cook-Taylor House, owned by the Henry Taylor family and now a Bed and Breakfast in Natchitoches, was used for the outside front of the house, and most of the scenes inside the home and in the back yard. It is on Front Street by the river and can be easily located, as it is now known as “The Steel Magnolias Bed and Breakfast.” During filming, the Taylors moved out and rented an apartment. Meg Ryan was initially cast as Shelby, but she chose to make When Harry Met Sally instead. The movie is based on a true story. Robert Harling wrote it about the last three years of his sister Susan’s life. Shelby loved pink. Remember her wedding? 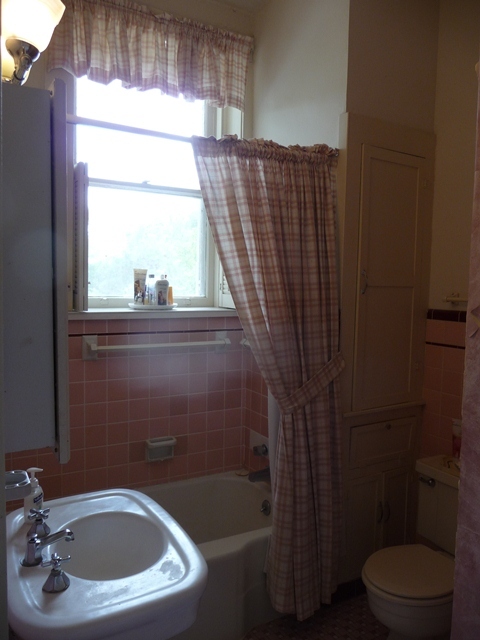 The striped curtains are still there! For more photos and information, check the listing with Andy Osborn of Coldwell Banker and visit the B&B website for room rates and availability. Oh… this is sweet! I like this place for its bones and of course, its history. I’d change some things around, but the charm should remain. Thank you for this interesting post, Julia. One of my all-time favorite movies! I wouldn’t be tempted to buy the house, though. Thanks for posting! I was thinking the same thing! The wedding wasn’t pink! It was blush and bashful! I love that house! I watch the movie just for that house! Neat to see how much it has been kept the same. Thanks for finally doing Steel Magnolias Julia! 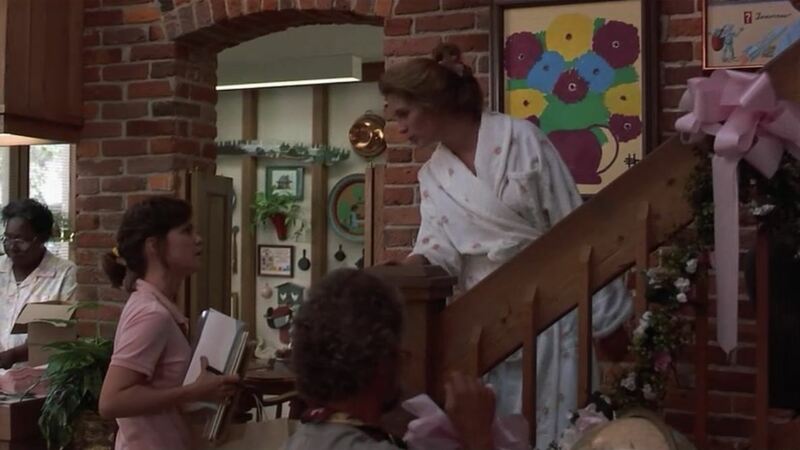 The décor is dated because the fact that it’s the house from Steel Magnolias is its main drawcard. That’s why it’s called ‘Steel Magnolia House’. 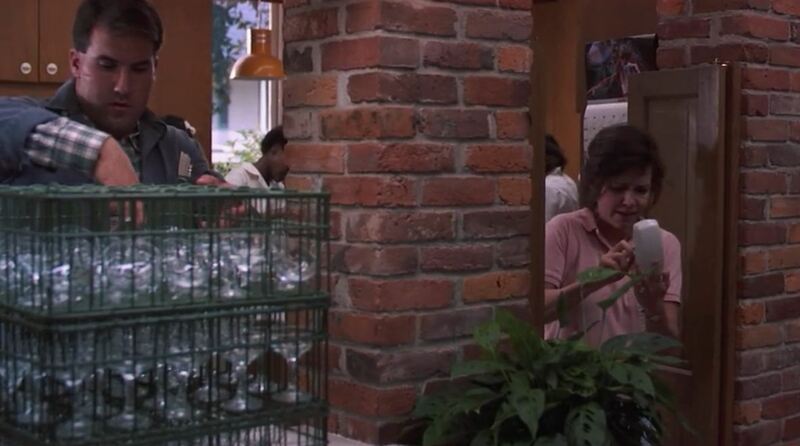 The vast majority of their business would come from people who are only staying there because of the movie, so it wouldn’t make sense to change the décor… Notice they have lots of pictures relating to the movie around the place, too. I was thinking that maybe they would have updated the house, but I guess if I had a famous movie house, I might want it to keep the movie look too. 😉 The house has such great lines…I bet it will look fabulous if it gets updated! One of my favorite movies!! 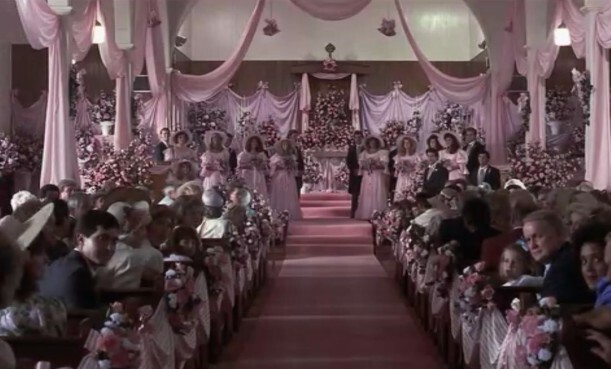 When I got married I had my hairdresser do my hair like Shelby’s and my bridesmaids dresses were – you guessed it PINK!!! Great old house. I should totally watch that movie again! This is also one of my favorite movies! I remember going with other young moms and there wasn’t a dry eye in the group as we watched this move. We all loved this move. Steel Magnolia’s group of new and veteran actress’s performance was outstanding. I also loved this historical home. 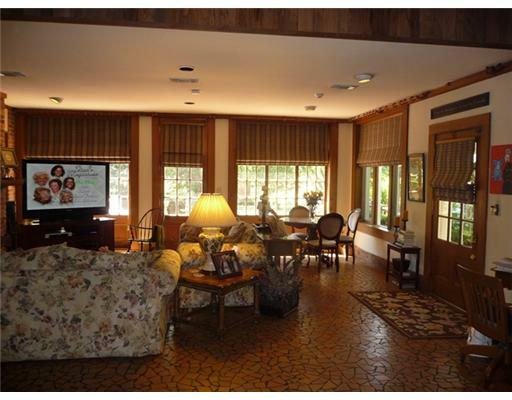 Beautiful woodwork, floors and porch, but my guess a new owner would update some areas. I will be looking at watching this move again in the near future. Thank you for this fun look at this home. Wow! What a blast from the past! I loved this movie when it came out! I didn’t realize it was based on a true story. Interesting tidbit. Thanks for another great post, Julia! So I just went and googled a bit about the background of the story since I had no idea it was based on the actual death of Robert Harling’s sister. Did you guys know he wanted to portray as much of the family’s experience in dealing with Susan’s death as possible, so he actually cast many of the real doctors, nurses and hospital staff who cared for her in real life in the movie as he could? I caught this movie on tv years ago and loved it. It’s hard to believe that this house was built in the 1800’s. Looks like it’s stuck in the 80’s. Someone needs to bring this home back to it’s original time period. Thanks for posting this! I grew up in Natchitoches, LA! We moved awhile back to Atlanta, GA, but always remembered my hometown fondly! 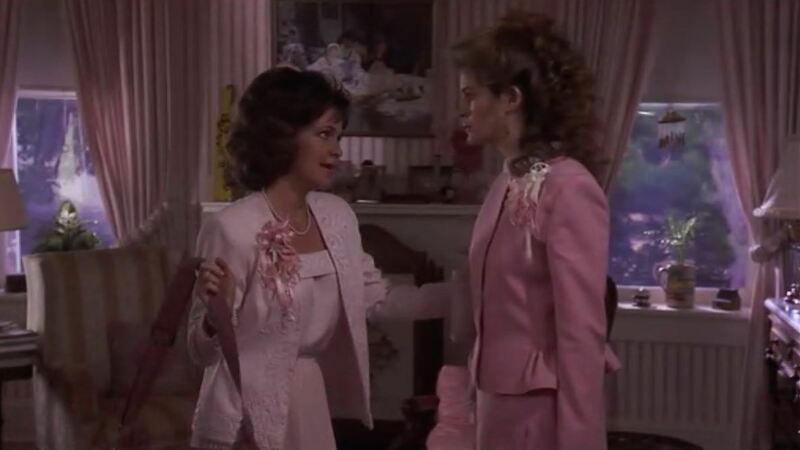 We were in love with Steel Magnolias when it came out and are still in love with it today. My elementary school (Weaver Elementary) is in the background in one scene. We always went to see the Christmas lights on the river bank and were constantlly going up and down the brick road (I can still feel the bump, bump, bump…).My twin sister even named her yougest daugher’s middle name after Sally Field’s character (Malynn). As a fellow blogger, I appreciate all of the time you put into this…thanks for the trip down memory lane! How fun to see your hometown on the big screen! I love it when you do movie houses!! What a wonderful old house! How interesting, Julia. I must watch this movie again,because I loved all the actors and the house and the story line. And thanks to Cindy, I now know that most of the medical staff are actually real people(as opposed to actors). Thanks for the post. Julia! This is why I love your blog SO much!!! One of my very favorite movies of all time, and I loved seeing the house. It’s very charming, even though not totally updated. Loved this!! Thank you!!! wow! thank you for sharing those memories!!!! i simply loved that movie. it came out after my mom died and between that and “beaches,” i was done!i always knew how to have a good cry. It looks like this is one of the few movie-used houses where all the interior scenes were filmed in the same house as the exterior. Steel Magnolias was the last movie I took my late mother to see at a theater. She caught the hype on Oprah and insisted on going to see it, though her mobility made going to a theater difficult at that point. She was not disappointed and neither was I.
Oh, this is my favourite movie house of all time. But mainly because the movie was so exceptional and holds such dear memories for me. But I wouldn’t want to buy it – it needs updating, and I just wouldn’t have the heart to change it. Thanks for sharing this Julia. I had a second look at the pics today, and I don’t think that’s a giant light fixture over the island in the kitchen, it looks like a giant exhaust fan- with maybe a light in it! (In a later pic you can see the range under it)! I’ve never seen anything like it, but it sure makes a “statement”. It appears there might be an indoor grill on the wall opposite (with a regular exhaust hood)! I love the movie, but am not a purist, for that price I’d want some updating! How fun to take a peek inside, and see how much is the same! My Mom went to school in Natchitoches, and it’s still her favorite town in the whole world. It is quite charming! Now the only thing missing is a red velvet armadillo cake in the kitchen! I’m so glad you said you watched Steel Magnolias on Netflix– I immediately added it to my queue and watched it within the day! What a great, touching movie, and a welcoming home. Too bad I don’t have an extra $2M laying around…. My sister, Nancy jo and I used to text the lines from that movie back and forth to each other. We knew it by heart. Nancy died last November. I have not yet been able to watch the movie. I may not ever be able to watch it again. But the memories are good. I stayed here in 2008 and wrote a letter to Robert Harling, the play/ movie author, before I arrived, hoping to meet him. While I was touring the filming sites, my cell phone rang… It was his parents, the real life Drum and M’Lynn, calling to arrange a coffee date with me! I met them here in this house and they still cry when talking about their daughter ( the real life Shelby was named Susan) it’s a true story and still so real to the family it happened to . Amazing life moment. 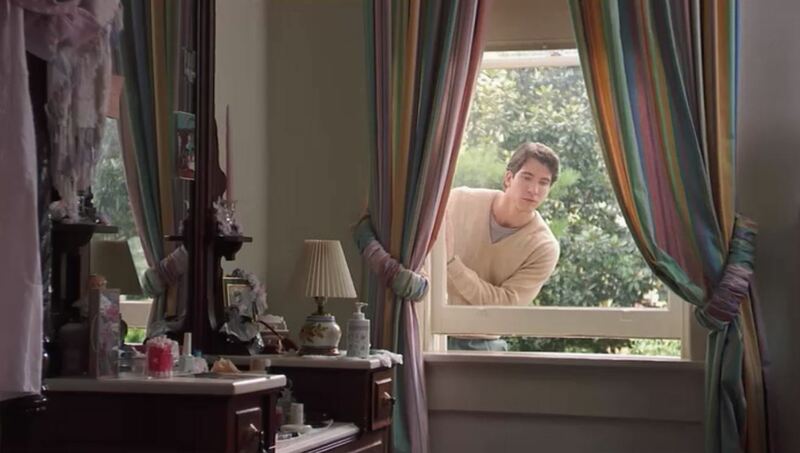 That’s so neat that you got to meet them and stay here! Just got back from an amazing girls weekend at this B&B. Thanks to this blog post we found out about the house!. The town is amazing and if you are a big fan you must arrange a tour (the B&B can do it for you) with Mrs. Lori Tate – the local who played Jackson’s mom in the film. She will take you around to all the filming locations and share her stories with you. It was wonderful! And after reading some of these comments, while the house is not updated by today’s standards, it is still absolutely perfect. You know those houses where you just instantly feel at home? Well, this is it. If I had the money, I’d buy it in a heartbeat and continue the B&B. 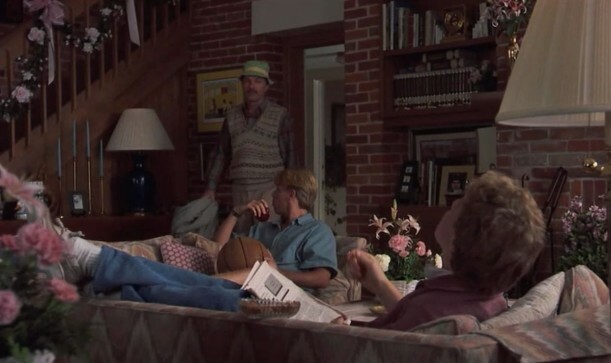 The current owners actually live in the house – in the area behind the brick living room that was M’Lynn and Drum’s bedroom in the movie. If this house were updated, it would lose its charm. Filled with antiques and history, still it lacks no modern convenience, and the bathrooms were fantastic. Best water pressure ever and the bed was the most comfortable mattress we have ever slept on.